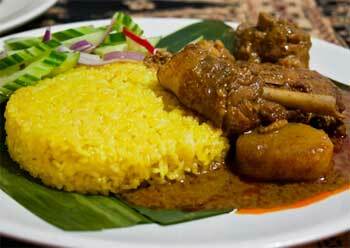 In Sumatra, Nasi Kunyit is served with Yellow Spiced Grilled Chicken or unti (shredded coconut mixed with brown sugar) as the main dish in a traditional ceremony such as a wedding ceremony. After the ceremony, the tumeric rice will be shared among the guests. Washed the glutinous rice and then steam for 15 minutes until it is half-cooked. Then transfer to another saucepan. Dissolve the shredded turmeric in the thick coconut milk, and strain the liquid. Add the salt and pandanus leaves to the coconut milk and bring to the boil.Pour the boiled coconut milk onto the half-cooked glutinous rice and leave to simmer. Occasionally stir until the coconut milk is fully absorbed. Add the lime juice, mix them well and steam until the glutinous rice is well cooked. Serve with chicken curry with potatoes and hard boiled eggs for a sumptuous meal.